It’s never too early for PIE. PUMPKIN pie. Amazingly creamy and decadent and perfectly spiced pumpkin pie. In bar form! With coco whip. Oh and an insanely fab two-ingredient crust. Did I mentioned they’re actually wholesome and vegan AND gluten-free?! Is this real life. 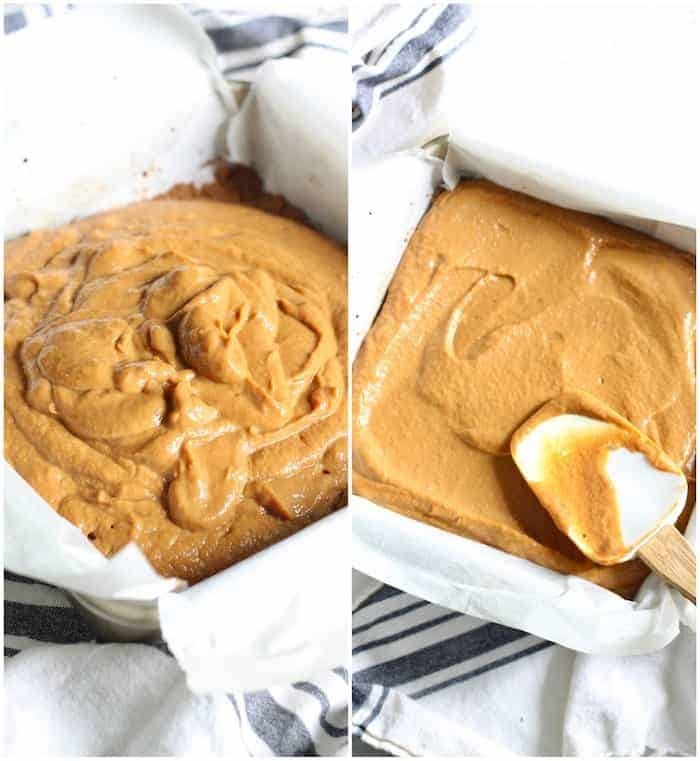 Jeff’s “mmmm” after tasting these vegan Pumpkin Pie Bars was louder and lengthier and more serious than any “mmmm” he’s ever muttered before. That’s right, these bars made with TOFU of all things got an overzealous stamp of approval by my meat-and-potatoes loving boyfriend. I was always too intimidated to make pumpkin pie, mostly because it’s not instant enjoyment. AKA, because I have to let them set in the fridge overnight before I can face-plant into them. Promise me you won’t make the same mistake I did! 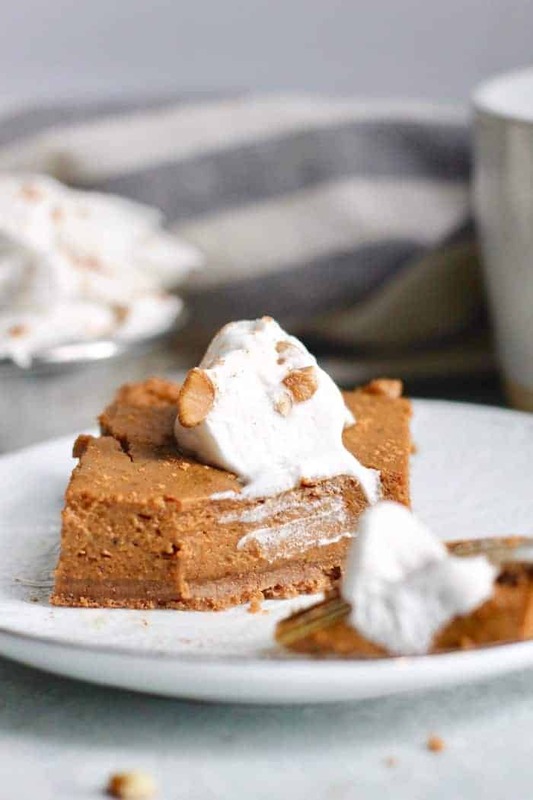 These vegan Pumpkin Pie Bars are well worth the wait. I might even go as far as saying they’re the best dessert that’s ever graced this blog. Holy guacamole!! 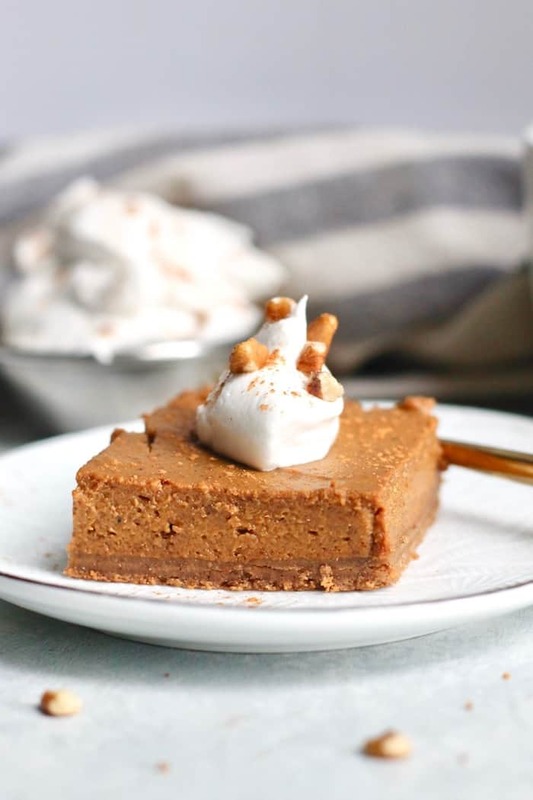 Now let’s dig into the recipe for these drool-worthy vegan Pumpkin Pie Bars! Both the two-ingredient crust and the creamy pumpkin spiced filling are made in the food processor, so it comes together in no time. The secret to the crust is COOKIES. Mmmhmmm. 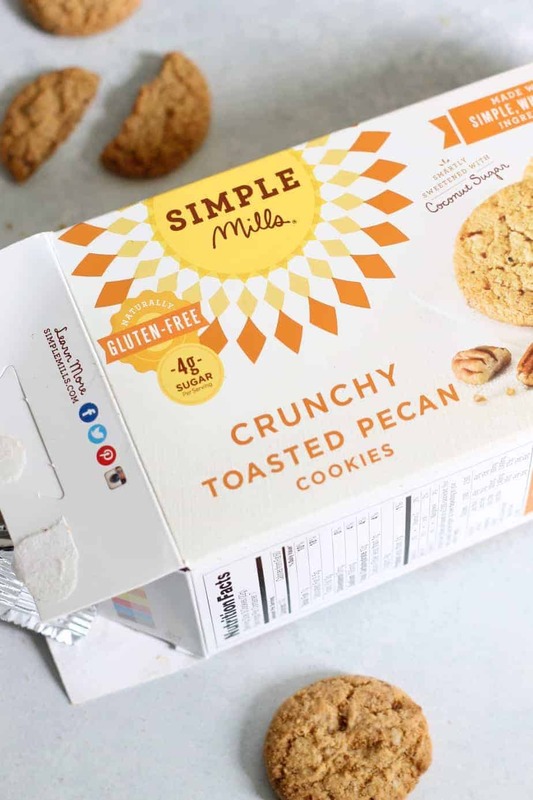 Simple Mills’ insanely amazing Crunchy Toasted Pecan Cookies, to be exact! I’m pumped because they’re officially available at Kroger, which is where we grocery shop most often. You can find the whole line of crackers, cookies, baking mixes, and frostings there. Yippee! I look so forward to noshing on a cookie or three with my morning cup of joe because they’re the perfect cozy fall treat. Jeff and I have also been enjoying a handful of these wholesome gems after dinner so I almost didn’t want to sacrifice a precious box on this crust. Thank heavens I did because the crust is just as good as the filling! The Crunchy Cinnamon Cookies would also be wonderful here. 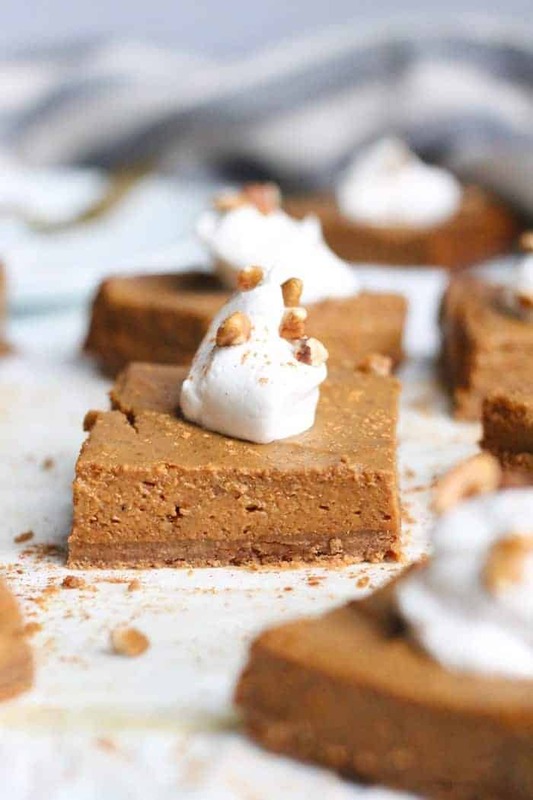 Thanks to the cookie crust, these vegan Pumpkin Pie Bars are also completely gluten-free. WOAH. For the crust, be sure to blend the pulverized cookies with the coconut oil until it looks kind of like wet sand. If you don’t blend it long enough, you won’t be able to form the crust. Once you dump the crust into the pan, it’ll take a moment to push it evenly the edges, but be patient! You’ll get there and it’ll be more than worth the extra elbow grease. 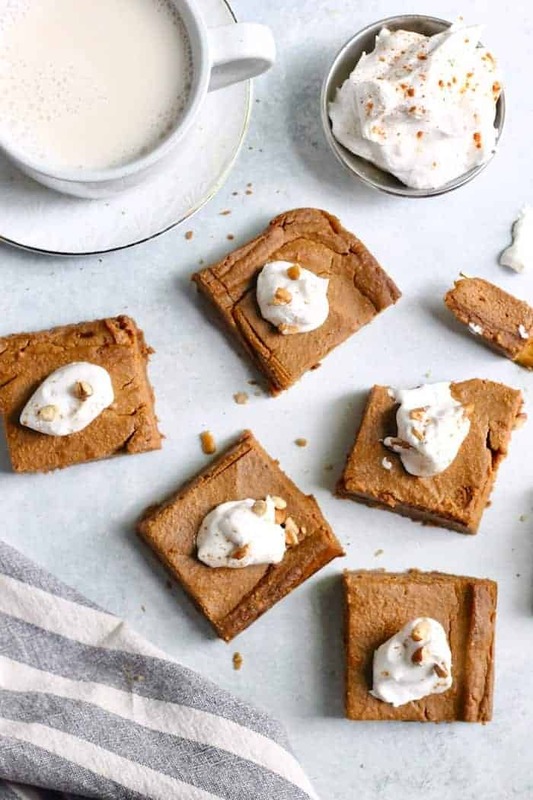 The secret to the filling for these healthy vegan Pumpkin Pie bars is silken tofu, which is a super soft kind of tofu that’s great for creaminess in things like pudding or pie. Here it functions as the vegan substitute for the eggs called for in traditional pumpkin pie recipes. There is no other substitute I’ve tried, but you should be able to find silken tofu at your regular grocery store. I have not tried this recipe with regular firm tofu, so I highly suggest you stick to the recipe on this one as it won’t set up without it. The silken tofu plus coconut sugar come together to make the perfect replacement for eggs and sweetened condensed milk. Regular brown sugar or cane sugar will work great, too! I like coconut sugar because it’s a bit less processed and refined than cane sugar. Wishing your lovelies a happy fall and even happier falling in love with these Pumpkin Pie Bars! Preheat oven to 350F and grease an 8-inch square baking dish. Line pan with parchment paper going both ways. Place cookies in bowl of food processor and pulse until it forms fine crumbs. Add coconut oil (do not melt) and process again for a minute or until more wet looking. Press mixture evenly and firmly into pan (this may take a few minutes). Bake crust for 8 minutes. Leave oven on and set crust aside to cool. To the same food processor bowl, add the filling ingredients. (I like to add a pinch of freshly ground pepper for extra spice!) Blend until smooth and creamy. Pour on top of baked crust and smooth out with spatula. Bake for 45 minutes or until filling is no longer jiggly. Cool on wire rack for an hour before placing in fridge to set for 4 hours or overnight for best results. YUM!! I looovveee desserts made with silken tofu. 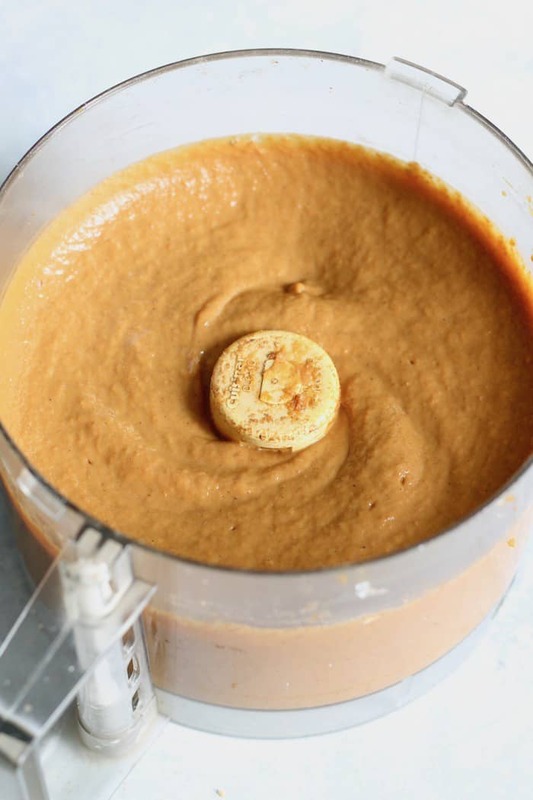 It’s seriously a magic ingredient – but I haven’t yet thought of using it with pumpkin! Feels like a no brainer now. I’m just going to have to see if I can get these cookies in Canada, or find myself a suitable alternative. Me too–totally agree that it’s straight MAGIC! Can not wait to make ! The texture looks amazing ! These look and sound ah-mazing!!! I love the sound of the crust, and I’m excited to make a baked good with tofu. Yum! Oh this looks incredible! I will have to look for simple mills this weekend. I have some silken tofu waiting for a new recipe so this is perfect :). I make a PB pie with it every year for my husband’s birthday – no one knows it is in there and the pie gets devoured! I was skeptical about a tofu pumpkin bar, but these turned out AMAZING! I love this recipe, and I’m definitely making this again. Thank you for sharing! Yayyy so glad you loved them! Can you tell me where you purchase simple mills toasted pecan cookies? Sure! I buy them at Kroger, which I linked to in the post. You can also find them at Whole Foods or buy them online through Amazon. So good! The crust is perfect. I bought a 16 ou tofu, so I have 8 ou left. I am going to make the crustless version next. Do you recommend I drain the tofu? Is there a substitute for the tofu? I can’t do soy.? 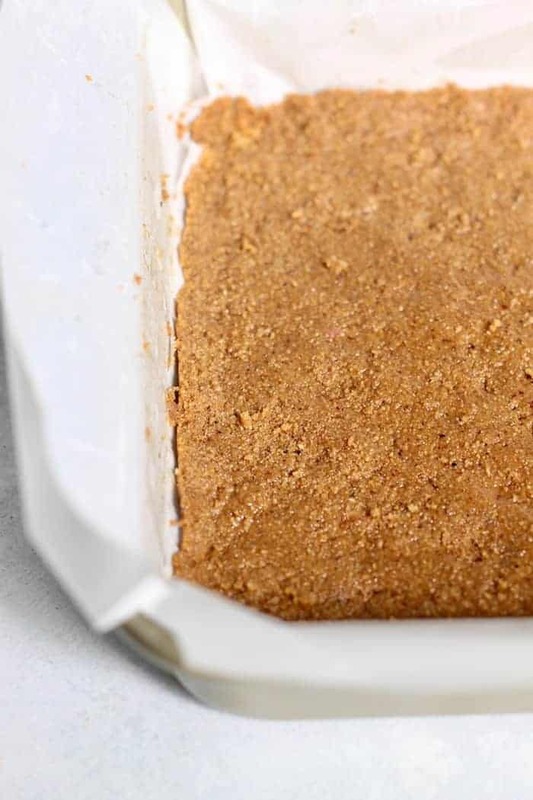 I’m not a huge fan of coconut but This recipe sounds to die for with that cookie crust. With this recipe using both coconut sugar and oil, does is have a noticeable coconut taste? Not at all! Zero coconut flavor :) use refined coconut oil. Enjoy! Oh boy, I’ve been searching forever for vegan pumpkin pie that isn’t too difficult to make! I’m wondering if I can adapt this recipe with a vegan pie crush, hmmm. Yes for sure you can! Just pour it into the pre baked pie crust and bake until set. Definitely making this for Thanksgiving! Can you swap arrowroot powder for cornstarch or will that not hold up as well? Appreciate the help and can’t wait to whip this up!! so would using an egg in place of silken tofu work? Do you know the ratio if it does?